Choosing the right filter is one of the most important steps in setting up an aquarium, but with all the factors that you should keep in mind and the many different filter types and brands available, things can get slightly confusing. To hopefully clarify things a little, keep reading for a list of the most common filter types and their pros and cons! Probably the most common filter type is the internal filter. These come in most aquarium kits or you can buy them separately at pretty much any pet- or aquarium store and online. Internal filters are usually pretty cheap, but the quality unfortunately varies and they do take up a lot of precious space in the aquarium. Some of these filters can produce a rather loud whirring noise, which really isn’t ideal, especially if your aquarium is set up in a bedroom. Most internal filters also only contain sponge and miss the important biological filter media that contains most of the beneficial bacteria and helps keep your cycle stable. That all being said, internal filters should usually work fine, especially for smaller aquarium setups. If you get one that is high quality, they are a nice and cheap option. Just be sure you buy the right type for your aquarium size. Cut off part of the sponge and replace it with biological filter media such as bio balls and you are all set. You can also hide the filter, as pictured to the right. A popular internal filter is the Aqueon QuietFlow. Though not very popular for nano aquarium setups, a canister filter is usually actually the best filter choice you can make. They can get a bit pricey and are sometimes a bit difficult to set up for beginners, but they have many advantages. They don’t take up space inside the aquarium, as they are actually meant to be placed underneath it. Canisters are also great because, unlike many other filter types, they have plenty of room to layer filter floss, sponge and biological filter media effectively. If you have a larger aquarium or keep fish that produce a lot of waste, looking into buying a canister filter is a good idea. My favorite is the EHEIM Classic and although these filters are obviously a bit more expensive, they are very high quality, come with different options for filter media and intake/outflow and will last for years. Replacement parts of the more popular brands usually easy to find as well. 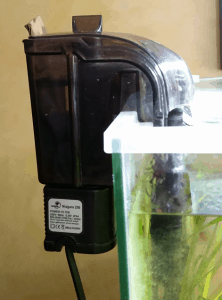 Hang on back (usually abbreviated to HOB) filters do exacly what the name suggest: they are supposed to be hung on the back wall of your aquarium. These filters can work quite well for smaller aquariums, especially due to the gentle “waterfall” flow, but they do have some disadvantages. HOBs aren’t ideal for larger or more heavily stocked aquariums, as their power and room for filter media is often limited. Biological filter media is not included in many cases. Another, more practical disadvantage is the fact that these filters sit on the back of your aquarium and therefore aren’t always easy to accomodate! You may need to remove part of your aquarium hood and it’s not possible to put your aquarium against a wall. Like internal filters, hang on back filters are not the absolute best choice. However, they work great for smaller or more lightly stocked aquariums. Just be sure to find one that has room for biological filter media and not just sponge, such as the AquaClear. This filter, like many others, does come with an activated carbon pad which you should ideally take out and replace with more biological filter media. These pads are really only necessary for emergencies. 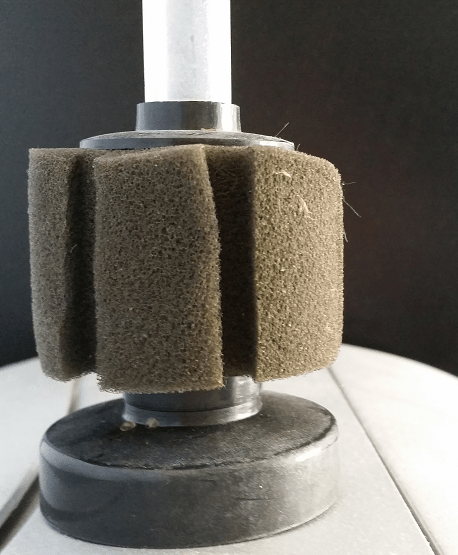 Sponge filters are different from the other filters mentioned because they are not powered by an impeller. Instead, they are powered with air. Because the water flow is usually quite weak and most sponge filters don’t contain biological filter material, they are not suitable for most setups. As mentioned in the intro of this article, sponge filters are ideal for temporary hospital tanks and small, lightly stocked aquariums around 5 gallons (18L) like as shrimp tanks and snail breeding tanks. Frail fins and tiny shrimplets can’t get sucked into the filter and the outflow will never be too strong. Sponge filters are hooked up to an air pump, which creates the water flow (and a pretty bubble effect). Most are nothing more than a piece of sponge and thus very cheap, although you do have to keep in mind the cost of a separate air pump and tubing. If you’re interested in using a sponge filter, keep in mind that all air pumps create noise and some are very loud. If you want to use more sponge filters at the same time, getting a stronger air pump such as this one with a multi-way valve is a good idea. If you’re looking for a filtration system for a big aquarium or even an indoor pond and don’t want to buy a very expensive large canister filter (or just want a super effective filter with loads of space for biological filter media), a pond filter or a trickle filter is probably the way to go. A trickle filter or wet/dry filter is a large filtration system that is placed underneath your aquarium. Water flows out of the tank into the trickle filter, where it trickles through biological (and sometimes mechanical) filter media into a sump (water holding space) and back into the aquarium using a pump. This “trickling” process exposes the water to lots of air, which is beneficial for the bacteria growing in the filter media. A trickle filter is a very effective filtration system that can be used for very big aquariums with messy fish, but also for “regular” aquariums under 100 gallons (380L). 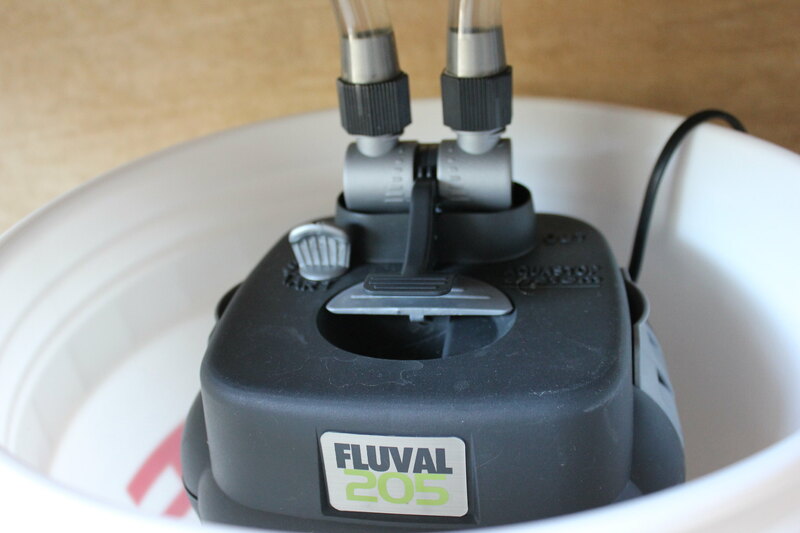 Trickle filters are mostly used by more experienced aquarists because making a DIY one can be quite difficult and buying one (especially for bigger setups) can get a bit expensive. However, theres no reason you shouldn’t use them yourself, as they are very effective! 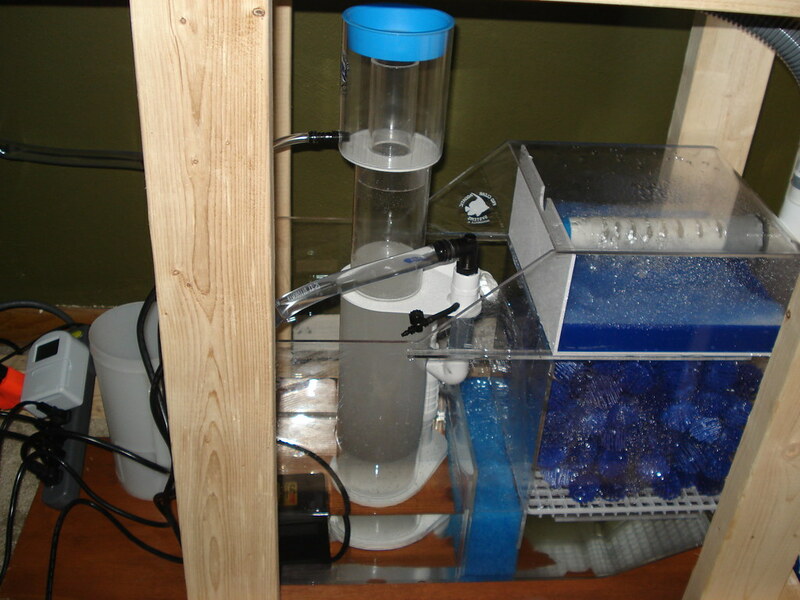 An example of a trickle filter for smaller aquariums is the Eshopps wet/dry filter. It’s not a very popular option for aquariums but if you can handle a bit of noise, a pond filter may be an option for you. There is a lot of of room for biological filter media (such as lava rock) and the filter is very powerful. 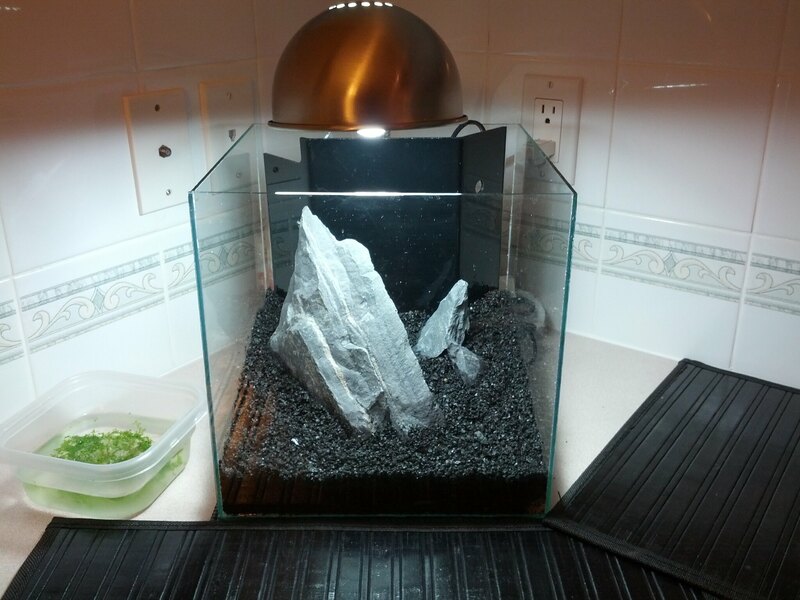 It does create a very strong flow, so I wouldn’t recommend a pond filter for regular setups. Another thing to keep in mind is that some pond filters are supposed to be placed above water level, so you may need a way to raise yours. An example of a pond filter is the Pond Boss filter kit. For more information on biological and mechanical filter media and what they do, check out how aquarium filters work. For more information on why the beneficial bacteria in your filter are necessary for a healthy aquarium, check out how to cycle an aquarium. If you have any more questions about choosing a filter or if you want to share some additional knowledge, don’t hesitate to leave a comment below! I’ve used sponge filters before in 5-10 gallon tanks with minimal fish (usually a Betta Splenden). I was under the impression that the low flow on the filter was better for the fish because they aren’t strong swimmers and it would cause them less stress than traditional filters that often agitate the top of the water a lot. Was I wrong in thinking that? No, that sounds just fine. As long as the tank is very lightly stocked a sponge filter works well and the low flow is great for Bettas. 🙂 I wouldn’t recommend it for normal community setups, though. Those usually require a little more filter power. Set up a new tank for our goldfish. It is larger than the one before, but it won’t get cleat. No matter whT we use it is still cloudy. It is a 38 gallon tank and we have an 75 gallon outside filter. I spent so much money for this new tank so our fish would be happy. I M so so upset. PLEASE HELP. WE Hve used everything and it is terrible. Hi! If you’re using a substrate, did you wash it beforehand? If that’s not it, you’re likely dealing with bacterial bloom. 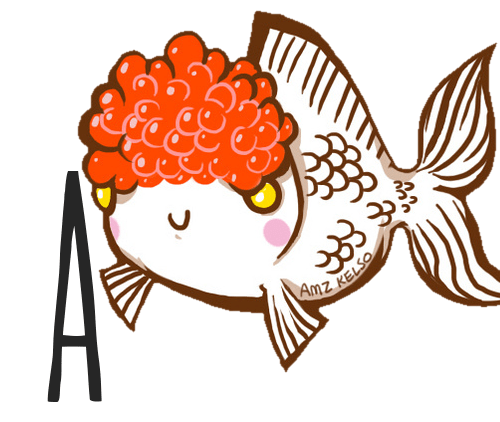 Did you properly cycle the aquarium before introducing fish? To be able to tell you a bit more about this, I’ll have to know your water values! I live in Hawaii & love goldfish! I currently have just one large fantail I’ve had for 2 years in a 20 gal. tall tank (purchased out of ignorance re poor choice of dimensions ideal to goldfish years ago) & I definitely am planning to give her a larger, better home soon , even if it ends up to be a clear Sterilite container. Funds are minimal, however I’d like to know what the VERY BEST type of filtration possible would be for approx. 55 gallons as I’d like to get another fish or even 2 more. My aquarium is indoors w/out a cover or gravel. I know wet/dry systems are optimal. Can anyone confirm this as well as tell me how to do a diy wet/dry sump SMALL enough to work well w/a 55 gal.tank, step by step?? I would be very grateful for the info! I would also love to learn what the ideal media for the system would be. Thank you so very much & my apologies for the length of this “comment”! Great to hear you’re trying the best you can to give your goldie a better home! A sterilite tub is absolutely fine and so is a large koi bowl if you can find one – I use a 55 gal one and it’s pretty ugly and blue but a great home for my fancies. I’d stick to one extra fish; I’ve got two fancies in mine and they grow SO well because of all the room and maintenance is minimal. As for the filtration, I personally use a pond filter similar to the one mentioned in the article. It has so much room for biological filter material and was pretty cheap. If pond filters are a bit too noisy for you a big canister filter (or two medium ones, which is what many goldfish keepers do!) would also be a good option. I don’t know too much about wet/dry systems because pond/canister filters have always worked fantastically for me, so I unfortunately can’t help you with that! You could ask around on aquarium forums. As for filter media, a canister will come with filter media that should be suitable. If there is activated carbon in there, take it out and replace it with biological filter media such as bio rings, bio balls or lava rock. In a pond filter (or wet/dry system), place sponge layered from coarse to fine and then biological filter material. Hi, what about overhead filters and underground filters? Although overhead filters take up a lot of space where lights should go, they are an excellent filtration system that provides oxygen for beneficial bacterial as well. What about moving bed filters? they are an extremely effective, low maintainence filter. The constant motion knocks off any solid particles, dead and/or weaker bacteria, only allowing vigourous bacteria to grow on the media. The most effective type would be fluidised sand filters. Usually when sand is motionless, there is no space for the bacteria to grow in between each sand particle. But when in a constant state of motion, the sand lets water go in between each particle, thus allowing a huge surface area. They are usually external, thus like the canister filter takes up less room in the aquarium, and with the fluidised sand filter, a smaller filter can handle the same bioload as a much larger cansiter filter. The dissadvantages to this type of filtration would be that it takes the longest time to cycle, and is extremely loud if using an air powered set up with plastic medias designed for this purpose, such as K1 Kaldness. K1 media is also very expensive. This type of filter may also be hard set up. Moving bed filters are very effective indeed, but they are not used a lot which is why I didn’t include them! They’re more something for really big setups and experienced fishkeepers I think. I don’t know anyone who uses them besides “monster fish” keepers with huge tanks – that being said, you’re definitely right about them working very well.